Most of you know that Russian President Putin has Russia saying “not yet” to GMOs and asserting their national focus on establishing themselves as the world’s largest exporter of organic food, as well as providing their people with healthy non-GMO food. This wasn’t just a spare of the moment decision either. It came about following years of analyzing the downside to using GMO foods and their overall effects on its consumers. Since there are no biotech industries that thrive there, Russia had no real dog in the fight, so to speak. 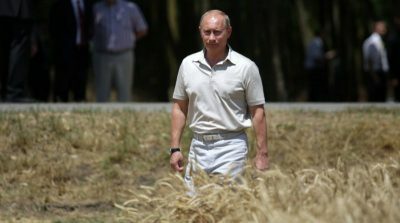 As part of Russia’s drive to provide nothing but organic food for itself, as well as other nations in Europe, the Middle East, and Asia, it is reported that the Kremlin has been awarding land free of charge to farmers or gardeners who pledge to produce only organic fruits and veggies. This was found in an article by Baxter Dmtry on Yournewswire.com. Dmtry’s article has Putin concerned about the westernized business model of poisoning its people with GMOs, junk fast foods, and vaccines, all for personal gains. The report states further that such tactics used by governments to subjugate their citizens are not only “dark/evil” but “counter-productive in the medium to long term.” Of course, these tactics suit the depopulation agenda, culling the herd’s “useless eaters” by controlling food and vaccinating everyone. Most Americans would prefer to think that Putin is just an off-key communist tyrant. It’s easier to accept mainstream media infotainment, whilst maintaining their comforting illusions. And this seems to be the comfort zone of the populous: ignoring their own government’s extreme corruption with its puppet at the head of internal corruption. A prior example of this is when Venezuela’s Health Minister, under Hugo Chavez, removed Coca-Cola’s Zero sugar soda from its market. Instead of understanding the health issues of drinking diet drinks which contain aspartame, among other toxic ingredients, the socialism vs capitalism card was played and that move was considered an attack against “free enterprise”. There is still a minority that understands that Putin is a dedicated nationalist and a man of his word, and not necessarily communist or capitalist man he is made out to be. His concerns are certainly more elevated than his puppet counterparts, which are owned by the major corporations of the western world. The Russian Bear has been awakened and it wants to remain clean, green and healthy.